Stephen Thomas Erlewine (born June 18, 1973) is an American music critic and senior editor for the online music database AllMusic. He is the author of many artist biographies and record reviews for AllMusic, as well as a freelance writer, occasionally contributing liner notes. Erlewine was born in Ann Arbor, Michigan, and is a nephew of the former musician and AllMusic founder Michael Erlewine. 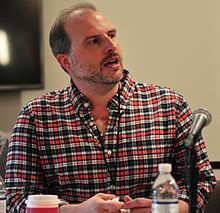 He studied at the University of Michigan, where he majored in English, and was a music editor (1993–94), and then arts editor (1994–1995), of the school's paper The Michigan Daily. He has contributed to a number of books, including All Music Guide to Rock: The Definitive Guide to Rock, Pop, and Soul, and All Music Guide to Hip-Hop: The Definitive Guide to Rap & Hip-Hop. Erlewine currently resides in Austin, Texas, with his wife and two step-daughters. ^ Credits for Stephen Thomas Erlewine at AllMusic. Retrieved June 14, 2015. ^ Jenkins, Terry. Biography of Michael Erlewine at AllMusic. Retrieved 2012-05-11. ^ "All Music Guide to Hip-Hop". Backbeat Books. Hal Leonard Books. Retrieved April 24, 2011. "Stephen Thomas Erlewine - Staff - Pitchfork". Pitchfork.com. Retrieved 2 June 2018. "Stephen Thomas Erlewine". Rolling Stone. Retrieved 2 June 2018. "Stephen Thomas Erlewine". Billboard.com. Retrieved 2 June 2018. "Stephen Thomas Erlewine - SPIN". Spin.com. Retrieved 2 June 2018.